Abita Amber is a Munich style lager brewed with crystal malt and Perle hops. It has a smooth, malty, slightly caramel flavor and a rich amber color. The beer pours a clear copper with amber hues and a fairly rich off white head. The nose is very inviting with sweet caramel malt aromas and floral hop notes. What a nice first sip. There is a little harshness but all and all a nice amber lager. The taste starts out with a touch a malt sweetness up front. That is followed by a cleansing effervescence as this beer washes over the tongue in the middle of the sip. The back end is very easy drinking with an almost effortless swallow. There is a perceived robustness that builds during the swallow into the finish. The finish is very nice with light caramel malt flavors and just a touch of floral hops to dry without bittering. The final aftertaste is just a touch of caramel malt sweetness. All and all this is a very nice Amber Lager; I am really enjoying this beer. There is a touch of that typical lager harshness. 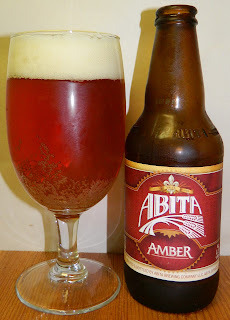 B | Abita Amber is a very good Amber/Vienna Lager with nice light caramel malt flavors, a refreshing effervescent mouthfeel followed by a clean dry finish.